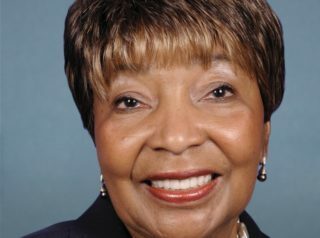 Eddie Bernice Johnson was born on December 3, 1934 in Waco, Texas. She earned a Nursing Certificate from St. Mary’s College in 1955, a BS in Nursing from Texas Christian University in 1967, and an MPA from Southern Methodist University in 1976. Thereafter, Johnson worked variously as a regional director in the U.S. Department of Health, Education & Welfare; a psychiatric nurse at a Veterans’ Administration Hospital; the head of a consulting and airport-concession management firm; and a board-of-directors member with Sunbelt National Bank. Johnson, a Democrat, served in both the Texas House of Representatives (1972-86) and the Texas State Senate (1986-92) prior to her 1993 election to the U.S. Congress, where she has represented Texas’s 30th District ever since. Johnson is a member of both the Congressional Black Caucus and the Congressional Progressive Caucus, and in the mid-2000s she belonged also to the Out of Iraq Congressional Caucus. When the House of Representatives voted by a 345-75 margin to defund the notoriously corrupt community organization ACORN in September 2009, Johnson was one of the 75—all Democrats—who voted to continue funding the group. In August 2010, it was learned that from 2005-09 Johnson had illegally given her own relatives large sums of money from a Congressional Black Caucus Foundation (CBCF) program that annually provides each CBC member with $10,000 that is to be awarded, in the form of scholarships, to deserving students in the member’s district. The Fund explicitly bars any of this money from being given to the relatives of anyone connected to the CBC or the CBCF—i.e., members of the Caucus, members of the Foundation, or aides of those members. Ignoring this prohibition, Johnson awarded 23 separate scholarships—with an aggregate value of more than $25,000—to her two grandsons, her two great-nephews, and the children of her Dallas district director, Rod Givens. Moreover, none of those recipients lived or studied in Johnson’s district. When news of Johnson’s malfeasance became public, she pledged to quickly repay to CBCF all of the scholarship money she had given to those recipients. In 2011, Citizens for Responsibility and Ethics in Washington (CREW) gave Johnson a “Dishonorable Mention” in its annual “Most Corrupt Members of Congress” report. In a December 2012 interview regarding some highly contentious budget negotiations that were ongoing in Congress at the time, Fox News anchor Neil Cavuto—noting that the only solutions Rep. Johnson would discuss were various forms of “revenue generation” (i.e., tax increases)—repeatedly implored the congresswoman to specify at least one budget item that she would be in favor of cutting. “If you’d shut up for just a second, I would try,” an angry Johnson retorted. But in the end, she was unable to name even a single cut she would support. In contrast to her lukewarm concern about the border crisis, Johnson feels a great sense of urgency vis-à-vis the issue of global warming. Asserting that “we must act boldly and … swiftly” in response to “the overwhelming scientific consensus” that “the climate is changing” as a result of greenhouse gases emitted by human industrial activity, she favors the passage of cap-and-trade legislation limiting the carbon emissions that American businesses are permitted to generate. In a climate-change panel discussion which she held in Dallas on March 31, 2014, the congresswoman cited “increased drought,” “extreme flooding,” and “increased risk of wild fires” as as examples of the harm for which climate change was already responsible. In January 2015, Johnson objected strenuously when Republican House Speaker John Boehner—without first asking President Obama for his approval—invited Israeli Prime Minister Benjamin Netanyahu to speak to Congress on March 3rd about the gravity of the growing Iranian nuclear threat and his strong opposition to the deal that the Obama Administration was pursuing with Iran. Johnson was one of numerous CBC members who announced that because of Netanyahu’s act of “disrespect” against Obama, they would be boycotting the speech. When the Daily Caller in February 2018 contacted Johnson and a number of her fellow Congressional Black Caucus members to ask if they would be willing to publicly denounce the notorious Nation of Islam leader Louis Farrakhan, Johnson was one of 20 who declined not only to denounce him, but also to issue any comment at all regarding his infamous anti-Semitic, anti-white rhetoric. For details about Rep. Johnson’s voting record on a range of key issues, click here. For additional information on Eddie Bernice Johnson, click here. Further Reading: “Eddie Bernice Johnson” (Votesmart.org, Ballotpedia.org, Keywiki.org); “Dems See Race Factor for Obama Foes” (Politico.com, 9-14-2009); “Congresswoman Eddie Bernice Johnson Offers a Statement on the Texas Voter ID Law” (11-17-2011); “Congresswoman Eddie Bernice Johnson Celebrates the 48th Anniversary of the Voting Rights Act of 1965” (8-6-2013); “Dems Push Expanded Community Reinvestment Act” (by Byron York, 9-16-2009); “Cavuto Cuts Off Dem Rep Who Refuses To Cite Any Cuts To Budget” (Breitbart.com, 12-14-2012); “Texas Democrat: What Would Be The Point Of An Obama Border Visit?” (by John Nolte, 7-7-2014); “Democrats Ask Teachers to Destroy Books Written by ‘Climate Deniers’” (Daily Caller, 4-4-2017); “Black Caucus Members Refuse to Denounce Hate Group Leader Louis Farrakhan” (Daily Caller, 2-7-2018). “TexMessage: Climate Change Should Not Be a Partisan Issue, Says Rep. Eddie Bernice Johnson” (Houston Chronicle, 1-10-2013); “Ranking Member Johnson Hosts Climate Change Panel in Dallas” (3-31-2014).